Gouache on artboard, approximately 8" by 12". Original is for sale on my Etsy shop! On average, how long does one of these take? it is fantastic job ! Gaaa.. this is so much more pleasing that the reconstruction in the actual paper. It looks adorable and I love how you've depicted it. Love the feathers here, looks cool! This dino got me to research dinosaurs more than I have in over a decade trying to figure out where it fits in. I have to say I have been out of the loop for soooooooo long, I was very confused at first. I'm really like that feathered critter. As I already said: Very floofey and cute and nice to see an Ornithischian from you! I think it's a bit too early to conclude that the structures on Kulindadromeus are protofeathers. Multiple filaments emerging from a single base plate are not found in any hypothetical feather morphology. On an interesting sidenote there were actually two teams working at Kulinda Valley. Their descriptions of Kulindadromeus' filaments aren't consistent with each other. Anyway, this is another lovely drawing from you. Also, denial is not just a river in Egypt. Oh and don't accuse me of denial. You're jumping on a bandwagon uncritically. Science is about questioning data, not appealing to authority. Questioning data is not denial. It's SCIENCE. Well. Questioning data without any kind of contrasted evidence in hand isn't really science at all. Hardly a credible source. The author seems to be obviously pushing his own agenda for a more scaly/reptilian conservative kind of non coelurosaurian dinosaur clades. Besides, we need at least one peer reviewed paper supporting the hypothesis if we are to take it into consideration. Also "agenda"? He's not some scaly-dino fanboy. He provides some numerous credible sources. Also on his "T. Rex-was-scaly" thing he doesn't even use the "It's-big-so-it would-overheat" argument (Again I don't agree with him there). Scroll down to the relevent discussion on T. Rex. It's pretty interesting even though I don't agree with him. reptilis.net/2012/07/23/feathe… Look thoroughly on someone's webpage before you make judgements. Read that link I gave you of the two teams. We have another Aetogate on our hands. Why shouldn't I be skeptical? Godefroit et al. didn't provide strong evidence for homology. "Multiple filaments emerging from a single base plate are not found in any hypothetical feather morphology. " Perhaps its time to expand or redefine our definition of feathers, then? Since feathers originated in Dinosauria and we are still trying to understand the whole evolutive process with new findings like these, I think there's room for a bit of flexibility. And if those are not to be called feathers I dont know what else they could be. Certainly not anything close to pterosaurian fur. Protofeathers and feathers do NOT emerge from a base plate. Developing a unique type of filament actually isn't hard from an evolutionary perspective. Plants and insects have done it. 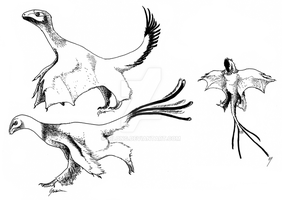 Furthermore I think as of now, the evidence shows that feathers emerged in Coelurosauria or a close relative of that group. I am planning on making a diagram about the integument of Ornithodira that shows the known type of integument of certain clades and their placement on the family tree. If I remember correctly, a recent study (2012 or so) on the genome of crocodiles even found that it contains all the necessary code to make feathers. Oh my gosh, its tiny little forelimbs!!! They're so tiny..!